One of the principal goals of estate planning is to come up with a strategy to reduce taxes associated with conserving and transferring land. When Bill and Sue Rose took over management of the Red Apple Farm in Phillipston, Bill was following in the footsteps of his father and grandfather, who had also raised apples on the land. While under Bill’s management, he converted the family business from a wholesale operation to a direct marketing farm selling retail and pick-your-own apples, peaches, blueberries, and pumpkins. 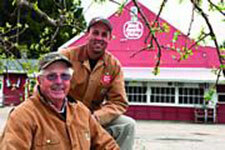 Bill wanted to honor the hard work of his father and grandfather and decided to permanently conserve the farmland. He also wanted to make sure his son—who was interested in continuing the farm—could become the next owner of the land without a mortgage or a big tax burden. He contacted state conservation agencies and found that the MA Department of Agricultural Resources was interested in protecting the orchards and fields. The state agency bought the development rights from Bill and placed a permanent Agricultural Preservation Restriction (APR, a conservation restriction for farmland) on 70 acres of the orchard, excluding a 7-acre area around the house and barns. But the state was unwilling to protect a 103-acre woodland surrounding the orchard. The woodland parcel had an approved gravel permit, which increased its value. It turned out that the funds Bill received from the APR resulted in a substantial capital gains tax. A tax attorney helped Bill find a solution for dealing with the taxes while protecting the remaining land. Bill made a donation of a conservation restriction to a local land trust on the 103-acre woodland. This donation was considered a “charitable gift” for tax purposes and allowed him to receive a substantial income tax deduction that offset the capital gains tax incurred by the APR. The land under the APR was transferred to Bill’s son Al and daughter-in-law Nancy, who continue to run the farm, and the woodland is used by Bill for forestry as well as hiking and hunting.